You can buy cheap coach tickets to many UK destinations here and save massively on your coach travel. See top UK coach companies and coach fares starting from £1.00 only. Get cheap coach tickets to over 1000 destinations in the UK from as little as £1.00! You could even travel for free on buses periodically across the UK. If you are willing to travel leisurely and you are not under time pressure, why not travel by coach or bus across the UK and the rest of Europe? Sure you wouldn't mind watching beautiful country side scenery on the go and enjoy a few stops on the way? Whether you are a student, a professional, or pensioner looking for cheap coach travel, we bring you the cheapest coach and bus travel tickets in the UK and many destinations in Europe and save on your travel cost. Depending on which part of the UK you are travelling to, you can book you coach travel with any of the following UK coach companies. You can compare prizes across any of the following to find yourself the cheapest fare to your chosen destination. There are many bus or coach companies in the UK. The following are the major ones that run large regional, national or international coach network, bringing you cheap coach travel. You can book any one of your choice here now. National Express is the Largest coach or bus operator in the UK. They cover destinations all over the country. If you book early, you can get really cheap coach tickets on National Express. They often offer discounts periodically, selling tickets to many UK destinations for £5 plus a £0.5p booking fee (Funfare tickets). Book National Express Coach Tickets to more a 1000 destinations across the UK. Whether for every day coach journey, like taking a trip from London to Manchester on coach, or for a relaxed National Express coach holiday. With over 16 million passengers carried to various destinations in the UK yearly, you can see why this is a very popular coach service that provides comfort and reliability.Remember to book early and look for National Express Funfares to secure unbelievably low price fares. These are available on only selected routes. If you are looking to travel in comfort and on a cheap coach travel to anywhere in the UK, then book National Express. If you are looking for a comfortable ride on coach travel to Europe and a number of other countries, then Euroline is the way to go. 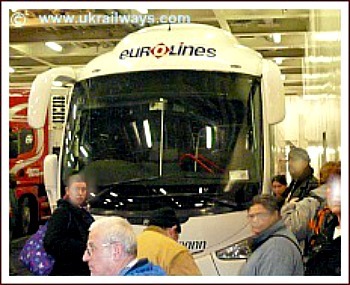 They are National Express international coach service to 33 countries within and outside Europe. From just £38.0, you can book a cheap coach ticket on Eurolines to over 500 destinations in Europe! Fares starts from £56 on advanced RETURN tickets to Paris, Rotterdam, Brussels and Amsterdam.You would be travelling in a luxury air-conditioned bus with nice leg room. This is not a no-frills long distant bus travel. You get coach comfort as good as it gets. They are fully air-conditioned, in-coach toilets, and you get picked up from most city centres, avoiding the need for expensive airport transfers. If you are passionate about saving the planet, travel on Eurolines coaches is the most carbon efficient way of travelling across Europe and save over 80% on carbon foot print, compared to flying!. The Oxford Tube coach company runs the most frequent coach and bus services in the whole of the UK. It runs 150 coaches on each directions a day, between Oxford and London on the M40 motorway. You are sure to get a coach ready to go every 10 minutes 24 hours a day! It is a very popular coach service amongst students and workers alike who commute on the Oxford - London route. You are guaranteed cheap coach tickets on this route too because the services are run by Stagecoach, the same company that runs Megabus. Students and children gets significant discount on the Oxford tube whether you are plying the London Hillingdon or London Oxford route. You can buy your ticket from the Megabus website or directly from Oxford Tube. The Scottish Citylink is Scotland's largest coach provider, running regular services between London and Scotland.It also has services between Scotland and Ireland. It provides services on a network of 19 routes linking London, the Midlands and Northern England with Glasgow, Edinburgh, Aberdeen, Dundee, Stirling, Aviemore and Inverness. It is a luxurious bus services, fully air-conditioned and toilet and free WiFi on board. You can book a cheap coach tickets on this bus service directly from their website. Cheap Coach Travel Ideas & Queries: Have Your Say! Do you have a query, comment or just a great story or ideas on how to get cheap coach tickets to any UK destination? Share it! Your story will appear on a Web page exactly the way you enter it here. You can wrap a word in square brackets to make it appear bold. For example [my story on cheap coach tickets] would show as my story on cheap coach tickets on the Web page containing your story.